Dr Jengo's World: Amazon's Black Friday Hoots! Here's my Black Friday Hoots from Amazon. Got the parcel before I left for my holiday but only managed to do an update now. 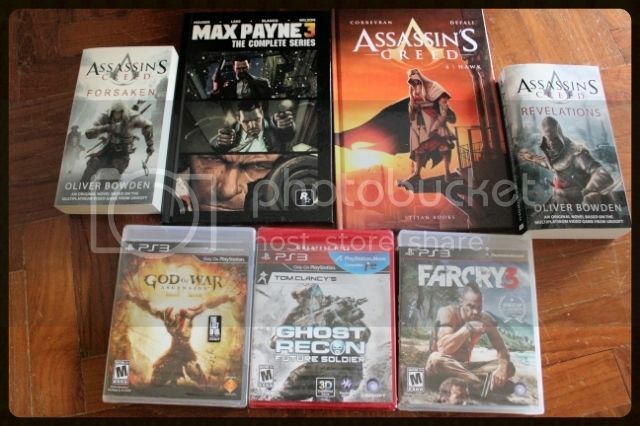 The games were all on discount so I added the books as well to get free shipping after adding my wife's shopping. Got God of War Ascension as I need the normal disc case to replace the Steelbook Edition that I have now. Another game still sitting in my backlog..
Far Cry 3 and Ghost Recon: Future Soldier are both games that I thought of getting since I like the UbiCollectibles figures. Just want to give myself a reason to buy the figures as I have been making a point of collecting figures only from games I have played and like. I have heard good stuff about Far Cry 3 so I'm pretty convinced of that, it's Ghost Recon: FS that I have to try out for myself. The Assassin's Creed Forsaken and Revelations novels are just additions to the rest of the series that I have been collecting and have yet to read. Maybe I should start on one of them now. Assassin's Creed Hawk should be interesting after the first 3 in the series. Nice hardcover graphic novel as well. Max Payne 3: The Complete Series brings the 3 digital comics together in a physical form for the first time. That will be a nice addition to the collection too. Was hoping to get more stuff from the Black Friday sale but nothing much that caught my interest. Maybe next time! If anyone wants to see inside pics of the books, just leave a comment below and I will try to get that up. Didn't have much time so just took a quick pic.